includes (TY4) Carbon Satin Black grille and (PJK) 20" Chrome-clad cast aluminum wheels with Satin Black ice pockets (Requires (G1E) Crimson Red Tintcoat, (G1W) White Frost Tricoat or (GB8) Ebony Twilight Metallic. Not available with (PCX) Enclave Tuscan Edition.) Enclave Sport Touring Edition Includes:Satin Black, Ice-toned grille 20" Chrome-clad cast aluminum wheels with Satin Black Ice-toned pockets Requires one of the following exterior colors: Crimson Red Tintcoat, White Frost Tricoat and Ebony Twilight Metallic. includes (PPE) 20" Chrome-Clad cast aluminum wheels with Bronze accents, (TN3) Bronze-toned grille (Available with exterior colors (G1F) Dark Chocolate Metallic, (G1W) White Frost Tricoat or (GB8) Ebony Twilight Metallic only.) 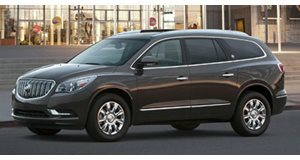 Enclave Tuscan Edition Includes:20" Chrome-Clad aluminum wheels with Bronze accents Bronze-toned grille Available with exterior colors Dark Chocolate Metallic, White Frost Tricoat or Ebony Twilight Metallic.